This corner at Julian and The Alameda in San José was recently made rounder and wider, to help traffic go around the corner without stopping. 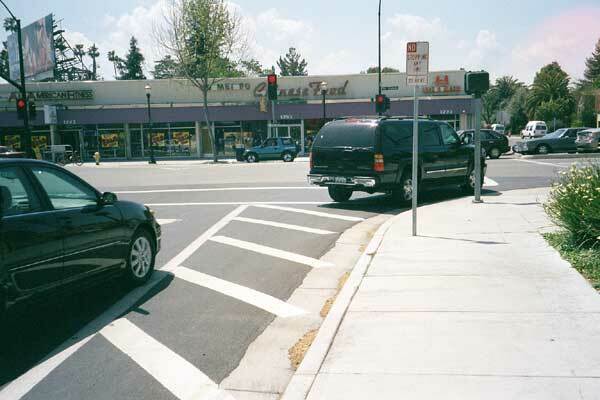 However, the community didn't want an anti-pedestrian corner there and complained. San José's solution was to mock a pedestrian-friendly design by drawing a square corner on the pavement with paint. The effect is predictably minimal as passing cars tend to ignore it and drive over it. Wouldn't you? Traffic engineers can feel proud of this kind of design compromise—the kind where the automobile wins and pedestrians lose. SAN JOSÉ: Where cars matter more than people.